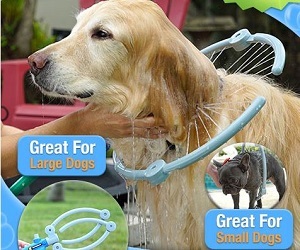 Just connect Woof Washer 360 to your hose, add shampoo, slip the hoop over your dog and turn on. The soap and water instantly mix, creating a sudsy solution to scrub your pup clean, from head to tail. Your dog will be shampooed and rinsed in under one minute. The secret is in the 360 degree design that allows for a ring of water to jet gently around your dog for 360 degrees of clean. Easily control the water pressure to your dog’s liking with the pressure control handle. Woof Washer 360 lets dogs of all sizes get 360 degrees of clean.